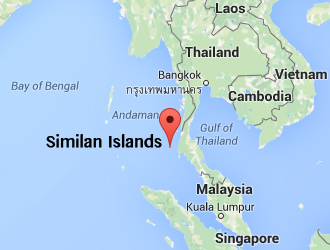 Similan islands, how to get there? Traveling to the Similan Islands is very easy since you can follow multiple roads to the paradise. The fastest way is by plane but you can also reach the islands via sailboat or speedboat. The Similian Islands are located on 570 kilometers south from Bangkok but are fairly good accessible by road and boat. We will describe the fastest ways to getting to the Similan Islands from from Bangkok. While Flying to the Similan Islands isn’t possible you can fly to the popular island of Phuket. Daily flights leave from Bangkok International Airport to Phuket International Airport. The prices for a return ticket are averaging around $125. When you land on Phuket you will have to take the boat from Chalong or Patong (closer to the islands) that brings you to the Similan Islands within a few hours depending on which Island to visit. Koh Tachai will take up to four hours and Koh Similan only two or three. 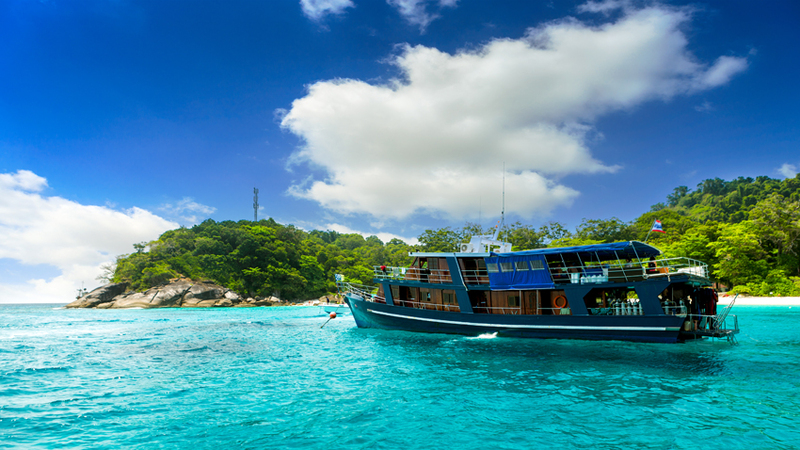 It is possible to travel from Phuket to Similan Islands multiple times a day. It is also possible to book a Similan Islands day trip from Phuket. Multiple roads and waterways lead to the Similan Islands. The fastest but most expensive one is via plane and speedboat. The cheapest trip from Bangkok is by night bus and taxi boat. Chalong and Patong are both good places to depart from in Phuket but the mainland offers the most boat departures from Thap Lamu near Khao Lak or Ranong. The cheapest option to travel to the Similan Islands is via bus and boat. You can arrange a full return journey for around $75. It will cost you more than a day of travelling. So getting there takes a lot more time than flying. The fastest travel option you can do is taking the night bus to Ranong or Khao Lak from Bangkok and from there arrange a boat to the Similan islands. In total it will probably cost you around 13 hours before you can relax on the Similan Islands. It will take you around two hours from Khao lak to Similan Islands. Another common way to travel to the Similand Islands is via sailboat also called liveaboard boats. There are a couple of sail charter agencies that depart for the islands a multiple times a week. The sail schedules depend on the weather, the season and amount of people that want to join. Plan this ahead of your journey else you will probably miss the boat! 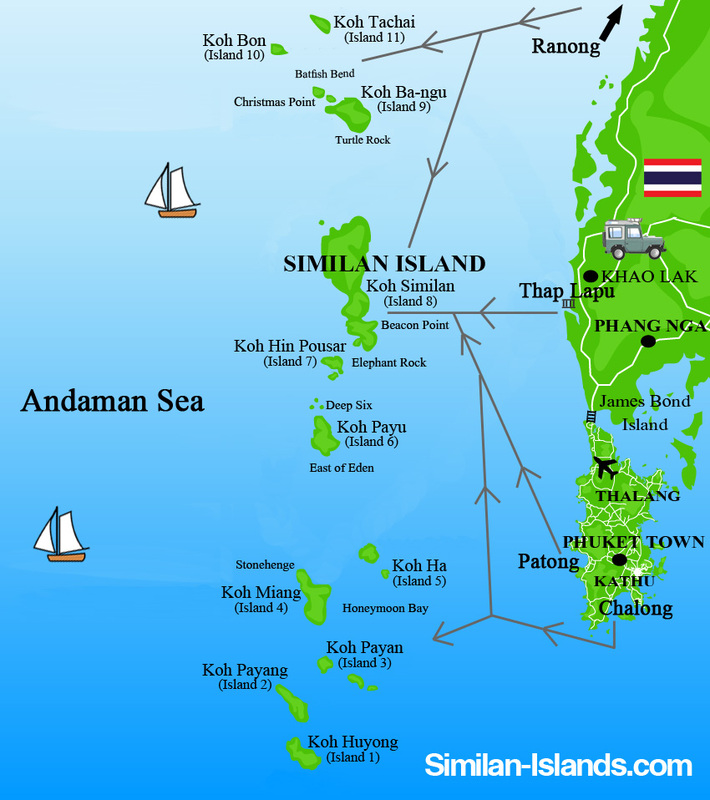 It is however a great way to explorer the beautiful Andaman Sea and do some island hopping on the way. The real castaway experience! The sail charters depart from Chalong, Patong, Thap Lamu, Kaho Lak, Ranong and other places on Phuket. It is also possible to book day-trips from mainland Thailand to the Similan Islands. These trips will take up the whole day and you have to get up really early if you leave from Phuket. Depending on where you are staying and how much money you’re willing to pay for a boat the average travel time is around 2-4 hours. Take this advice with you; when you arrive at the Similan paradises you don’t want to leave before the sun is going down.